Recent Movies that Really Excite? Time to shake things up a little bit here on the blog. I know most of my blog postings are all gear related, but “home theater” goes well beyond gear. Without the movies themselves the whole thing just becomes kind of a hollow pursuit. So today I kinda wanted to talk about current trends in movies and possibly get some feedback from friends. 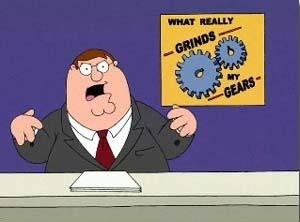 So in the great words of Peter Griffin “You know what really grinds my gears… movies today”. I’m looking on IMDB right now at a list of upcoming releases for something that excites me. Something that I may actually buy on disc, or even crazier yet, get me to spend money on a ticket to watch it in the theater. Not much! Has my taste in film just become more narrow? I used to watch anything when I was younger. Now I bet I watch maybe 10 new releases a year… at best. So I’ll ask, what recent releases or upcoming releases excite you? I’ll just throw out a few recent releases as well as some upcoming ones that have me excited. Fury – in summary, Brad Pitt, Sherman tank, WWII. Have yet to see this one, looks really cool. Interstellar – Cristopher Nolan directs film that is about first attempt at interstellar travel through warping space. Comes out in a few months and I have no idea what to expect, sure to be gorgeous and very cool. The Grand Budapest Hotel – I still haven’t seen the latest installment from Wes Anderson. Very high on my current “watch list”. Snowpiercer – What you need to know is that the last remnants of society on a plane that circles the Earth on a train in a perpetual winter, the the folks stuck in the back get ticked. Just watched this, and was very pleased with what I think is a welcome departure from the typical Hollywood comic book action movie. The Monuments Men – Yet to see this one. A bunch of Museum guys get together at the end of WWII to gather up artwork stolen by Nazis. Godzilla – Yeaah, as a lover of old campy “B movies” and old sci-fi I really need to at least sit down and give it a shot. I thought the last one was aweful, so the bar is low. Unfortunately, I’m starting to think my taste in movie continues to narrow as I age. For instance I’m really lukewarm on comic book movies as of late. I love original ideas in that regard. I’m also not a big horror guy, at least not modern horror. I have a list of serious movies I need to watch as well; but I find myself just not making time for it. One example would be “12 Years A Slave.” I know it has excellent, and moving content based in history, that should be given my time. I just find it takes emotional effort to fire it up, effort that I just don’t always want to muster. So, I’m curious what your excited for? Do you think made for television mini series and shows like Game of Thrones, or the Walking Dead pulls you away from the time you would have gave to watching traditional film? How about independent cinema? I think digital film-making and distribution could easily upset the traditional Hollywood model when it comes to anything that isn’t a major blockbuster. Have you seen any great independent movies that received very little marketing? Snowpiercer sound interesting! I hadn’t heard of it. I definitely want to see Interstellar. Have not be disappointed by Chris Nolan yet. I must say I really enjoy the long-form storytelling of a series like Game of Thrones. I haven’t watched many other series yet. I also feel that as parent, I have 40-55 minutes several nights a week to watch a show, but 90-120 is harder, and my wife and I do sometimes watch movies in two sittings, but that’s less appealing.